New System – On Demand Training with Kaivac’s KaiTutor! Mounted directly to Kaivac’s cleaning systems, the KaiTutor makes personal training readily available in a stimulating format. Now, even inexperienced workers can quickly become highly productive cleaning professionals, and it’s a convenient way to reinforce prior formal training. Recent innovations like Kaivac’s No-Touch Cleaning® and OmniFlex™ systems, greatly enhance the quality and efficiency of cleaning. Many organizations can’t exploit these advantages because they lack timely and effective training – especially those with high turnover or an unskilled workforce. KaiTutor, the “anytime, anywhere personal trainer,” facilitates the adoption of new technologies by eliminating these barriers. 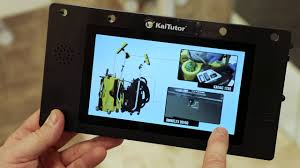 Along with the KaiTutor, Kaivac provides an extensive library of information covering such topics as operational procedures, routine maintenance, troubleshooting, repair, machine specific overviews, tips, tricks, and more. Each Kaivac, along with each OmniFlex system, now comes standard with a KaiTutor. Please contact your New System Account Consultant for additional information on this exciting new innovation in training for the cleaning industry. Kaivac, Inc. was founded in 1997 out of a need to solve the number one building maintenance complaint – dirty restrooms. As long as there have been toilets, janitors have been on their hands and knees swabbing and wiping them clean (or almost clean). No wonder the worker morale has been so low and the turnover rate so high! Bob Robinson, Sr., founder and President of Kaivac, Inc., set out to develop a more dignified yet more productive method of cleaning restrooms.